Recent studies have shown that “complex” peace agreements with long lists of provisions are more likely to lead to a return of violence within five years. 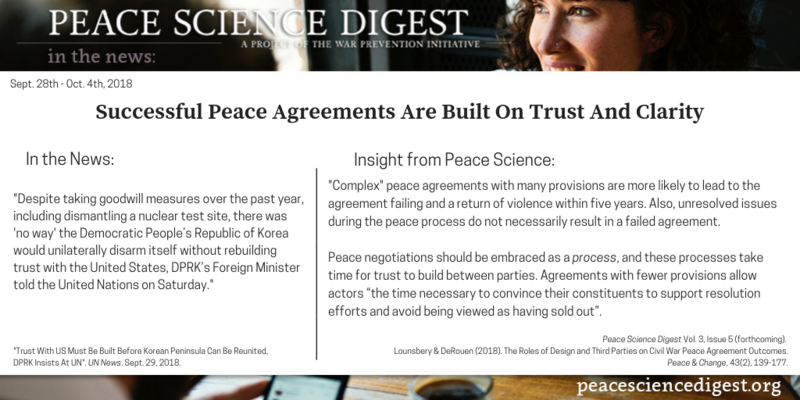 This research is important to the ongoing Korean peace process: focus should be placed on peace agreements built on trust with clear, actionable provisions. Peace agreements with a greater number of provisions (more complex) are more likely to result in the agreement ending and the return to violence within five years. Also, outstanding issues left unresolved in an agreement do not necessarily result in the peace agreement’s failure. The authors suggest that these findings reinforce the notion that conflict transformation should be embraced as a process, and that these processes take time for trust to build within and between actors. Agreements with fewer provisions allow actors “the time necessary to convince their constituents to support resolution efforts and avoid being viewed as having sold out”, by either abandoning their cause or failing to address issues important to their base. “Trust With US Must Be Built Before Korean Peninsula Can Be Reunited, DPRK Insists At UN”. UN News. Sept. 29, 2018. Peace Science Digest Vol. 3, Issue 5 (forthcoming). Original research from Lounsbery, M. O., & DeRouen Jr, K. (2018). The Roles of Design and Third Parties on Civil War Peace Agreement Outcomes. Peace & Change, 43(2), 139-177.